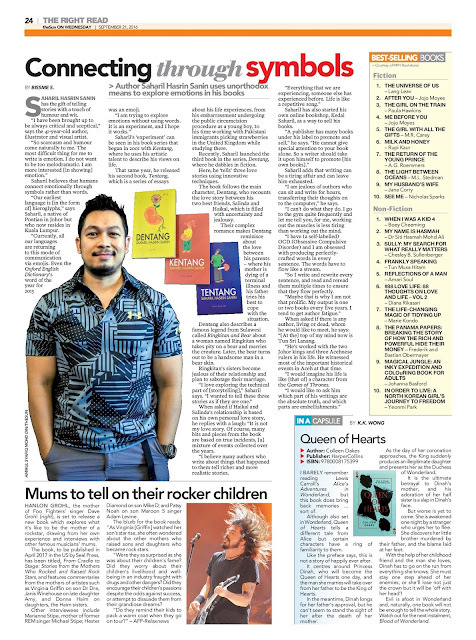 For the book Section in theSun today, I highlighted a Malay writer Saharil Hasrin Sanin. He talks about his three books Kentang, Tentang and Dentang Below is my story. SAHARIL HASRIN SANIN has the gift of telling stories with a touch of humour and wit. “I have been brought up to be always critical and sceptical,” says the 41-year-old author, illustrator and visual artist. Saharil believes that humans connect emotionally through symbols rather than words. “Our earliest language is [in the form of] hieroglyphs,” says Saharil, a native of Pontian in Johor but who now resides in Kuala Lumpur. Saharil’s ‘ experiment’ can be seen in his book series that began in 2001 with Kentang, where he uses his artistic talent to describe his views on life. That same year, he released his second book, Tentang, which is a series of essays about his life experiences, from his embarrassment undergoing the public circumcision procedure as a young boy, to his time working with Pakistani immigrants picking strawberries in the United Kingdom while studying there. Recently, Saharil launched the third book in the series, Dentang, where he dabbles in fiction. Here, he ‘tells’ three love stories using innovative techniques. The book follows the main character, Dentang, who recounts the love story between his two best friends, Salinda and Haikal, which is filled with uncertainty and jealousy. Their complex romance makes Dentang reminisce about the love between his parents – where his mother is dying of a terminal illness and his father tries his best to cope with the situation. Dentang also describes a famous legend from Sulawesi called Ringkitan and Bear about a woman named Ringkitan who takes pity on a bear and marries the creature. Later, the bear turns out to be a handsome man in a bear skin. Ringkitan’s sisters become jealous of their relationship and plan to sabotage their marriage. When asked if Haikal and Salinda’s relationship is based on his own personal love story, he replies with a laugh: “It is not my love story. Of course, many bits and pieces from the book are based on true incidents, [a] mixture of events collected over the years. “I believe many authors who write about things that happened to them tell richer and more realistic stories. 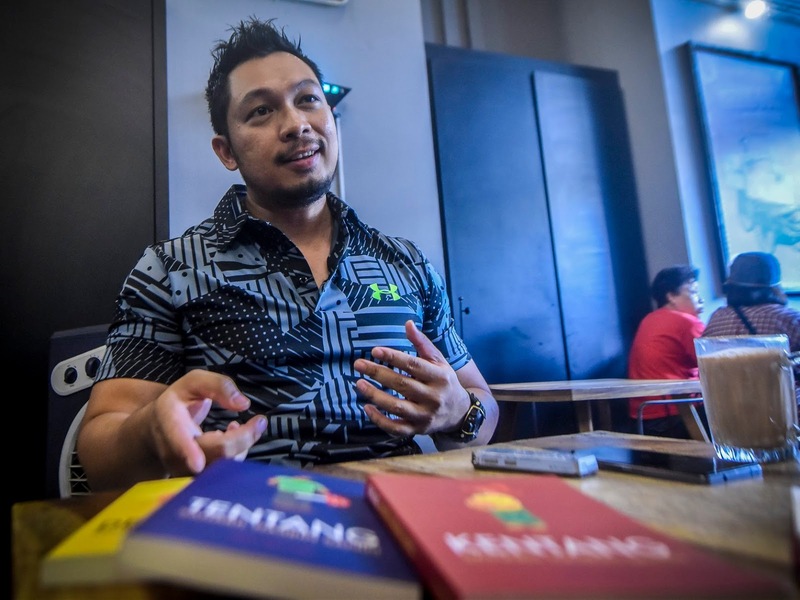 Saharil has also started his own online bookshop, Kedai Saharil, as a way to sell his books. “A publisher has many books under his label to promote and sell,” he says. Saharil adds that writing can be a tiring affair and can leave him exhausted. “I am jealous of authors who can sit and write for hours, transferring their thoughts on to the computer,” he says. “I can’t do what they do. I go to the gym quite frequently and let me tell you, for me, working out the muscles is less tiring than working out the mind. “I have (a self-labelled) OCD (Obsessive Compulsive Disorder) and I am obsessed with producing perfectly crafted words in every sentence. The words have to flow like a stream. “So I write and rewrite every sentence, and read and reread them multiple times to ensure that they flow perfectly. When asked if there is any author, living or dead, whom he would like to meet, he says: “[At the] top of my mind now is Tun Sri Lanang. “He’s worked with the two Johor kings and three Acehnese rulers in his life. He witnessed most of the important historical events in Aceh at that time.